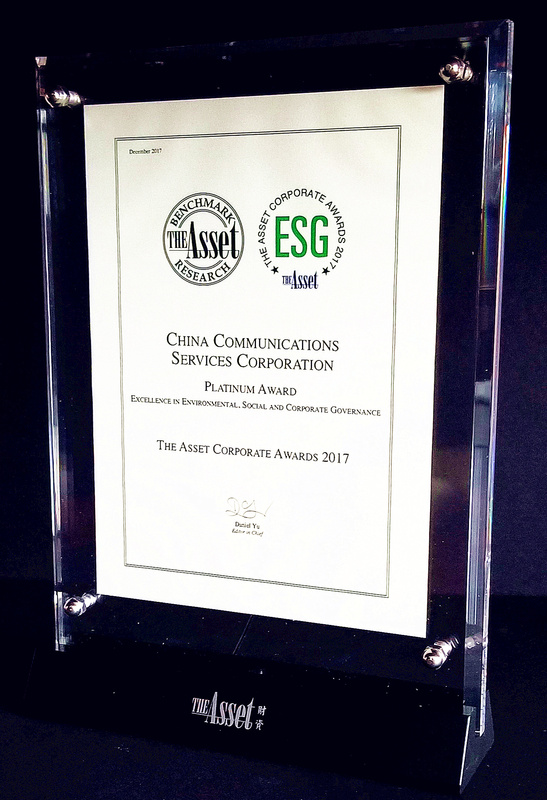 China Comservice Won Platinum Award in "The Asset Corporate Awards 2017"
China Communications Services Corporation Limited was awarded "Platinum Award - Excellence in Environmental, Social and Corporate Governance" in "The Asset Corporate Awards 2017" organized by the authoritative financial magazine, The Asset. The Asset is a renowned finance magazine in Asia and "The Asset Corporate Awards" has reached the 17th anniversary. The awards are designed to recognize listed companies across Asia with outstanding performance, and take into account disclosed information from the companies as well as feedback from the investment community. "The Asset Corporate Awards" not only recognize the companies in financial performance, but also evaluated and awarded companies in different categories according to corporate governance, social responsibility, environmental responsibility and investor relations. The winning of Platinum Award from The Asset well witnessed China Comservice overall excellent performance in the past years, and show the capital market’s recognition on our outperformed achievements in all the above assessment areas.